Defending champions Saracens were handed a record home European defeat by the team they beat in last season's final, Clermont Auvergne, in their rearranged game on Monday. Winger Alivereti Raka scored a hat-trick to give the visitors a 21-0 lead on a bitterly cold night in London. The champions got on the board through a penalty try shortly before half-time. But a stunning Flip van der Merwe try, set up by Raka, and a fifth score from Wesley Fofana left them reeling. And, although George Kruis went over for the hosts, Isaia Toeva scored a sixth try for the visitors as Saracens slumped to a sixth straight defeat. "We didn't see that coming," said Mark McCall, Saracens' director of rugby. "I know we've lost a few games in a row, but they were relatively tight games that we lost by a point or two here or there, but we never saw that coming." Given their status at the start of the season as the best side in Europe, any prediction of a Saracens losing run like that would have been labelled absurd by many. That was the word Clermont used to describe the 24 hours that led up to this match finally taking place, after it was called off on Sunday for health and safety reasons following several inches of snow in north London. The postponement and subsequent rearrangement was also called amateurish by the unimpressed visitors, and as if to make their point their start was professional in the extreme in front of a crowd maybe one tenth the size of that set for Sunday's sold-out encounter. Those that did turn up though were keen to make an impression, and the Clermont drummers produced a percussive performance matched only by their team. Saracens were without outstanding injured England forward duo Maro Itoje and Billy Vunipola - the former facing a race against time to be fit for the Six Nations after breaking his jaw, the latter on course for a January return from a knee injury. And they lost defensive linchpin Brad Barritt to an early collision that also put paid to Clermont lock Sitaleki Timani. Without his reassuring presence the hosts looked defensively shaky - they would end up missing 37 tackles in all - and the Clermont centres Damian Penaud and Wesley Fofana took advantage to show off their running threat to create the first two of Raka's tries. Penaud - the 21-year-old son of former France international Alain - made the initial break for the first try before Fofana attracted three defenders and executed a simple scissors for Raka to shrug off a tackle and race over. For the second try it was Fofana who made the first incision and when the ball came left, Raka again showed his power to finish from close range. And the Fijian winger had a 25-minute hat-trick when Parra was sent through a gap at the base of a line-out and dummied Alex Goode before sending Raka striding over. Parra converted all three and Saracens - chasing a third straight European crown - were facing humiliation. McCall added: "It shows what conceding a couple of early tries for the opposition can do to your confidence, but we missed so many tackles which is unlike us. "Individuals were falling off tackles and Clermont have the individuals to penalise us for that." Saracens simply had to score next and referee Nigel Owens was in no doubt that, after Farrell kicked a penalty to the corner, Fritz Lee had dragged the maul down illegally. Lee was sin-binned and a penalty try awarded, giving Sarries a glimmer of a chance. But the Clermont pack was well on top in the scrums and they then twice forced turnovers from attempted driving mauls before the break. It was a huge blow to Saracens' morale and matters got no better in the second half. The champions tried to lift their game after the break, but when Clermont turned the ball over and attacked from their 22 soon after the restart, Raka produced the moment of the match to kill off any hopes of a revival. Receiving the ball with apparently little on, he proceeded to beat four men on a weaving 60-metre run before finding the lumbering Van der Merwe with a superb pass for Clermont's fourth try. 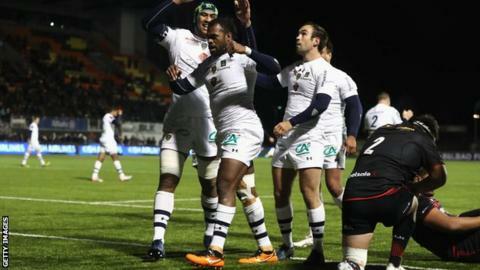 Fit-again France centre Fofana grabbed the fifth, and although discarded England second row Kruis scored a second Saracens try, their record defeat was made even more comprehensive as Toeava added a scarcely believable sixth try for the visitors. McCall insisted the postponement of the game was not blame for his side's performance. "We felt good as a group before the game, so the postponement wasn't really relevant," he said.